These superb Phoenix silk fly lines are precision built to the finest quality, using pure Chinese silk which is braided to form precision fly line tapers. Known for making the best silk fly lines in the world. All Phoenix lines are individually produced and lovingly handcrafted to maintain their reputation for their quality and performance. 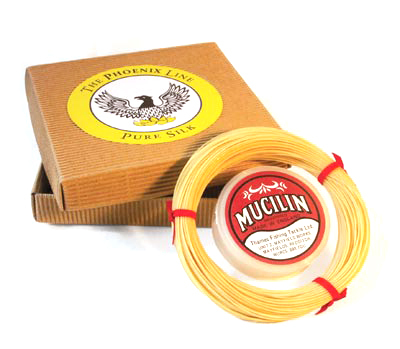 Every Phoenix fly line comes immaculately boxed, fully finished and ready to use. They are unaffected by extreme variations in temperature. And are quicker and smoother to lift from the water. Each Phoenix silk fly line gives the anger three options when fishing. Greased, the line floats high on the surface film, perfect for the dry fly. Un-greased it acts as a ‘slow sinker’, for the angler seeking to use an intermediate line. De-grease the tip and there is a ‘sink-tip’ of variable proportions. The Standard Line – Trout is a 30 yard line available in Natural straw, or Mere Green colour. Double tapered with fine tips and a precise 6 foot taper at both ends to allow reversal of the line. Made of the finest pure silk, natural straw colour, proofed with several coats of a special varnish and hand polished. The line comes complete with care instructions and a tin of Red Mucilin. Weight Forward Line is a 33 yard line in natural straw colour. A 6 foot taper, 11 yards of head and 22 yards of shooting line. The line comes complete with care instructions and a tin of Red Mucilin. The special ‘proofing’ of the braid gives no ‘reel’ memory and only minimum stretch to aid better hooking. The oils and varnishes ensure that the line is waterproof and supple. The Phoenix Line is so stable so that it does not leach linseed oil and become tacky with age. The special finish produces a line that shoots well, with the minimum of flash and maximises the added advantage of silk, which gives a smaller diameter for a given weight. Contrary to popular belief silk fly lines do not require extensive amounts of care and attention. A major misconception is the question of greasing the line to enable it to float. Only the lightest coat of Red Mucilin is necessary – apply the Red Mucilin with the pad provided and then wipe off any residue with a soft tissue. Over-greasing attracts dirt and scum and leads to the line sinking. Only apply grease to a dry line. If cared for properly the Phoenix Silk Fly Line should give the angler many years of service. After a day’s fishing wipe the line dry with a soft cloth and if possible leave the line on a line drier or in loose coils until the next fishing trip. At the end of the season, leave it in loose coils between two sheets of paper in a drawer for example.